Stefan Jacoby: In today's market, customers "want action, not excuses." With its history and emotional appeal, Volkswagen has a selling point competitors can't copy, said Stefan Jacoby, CEO of the Volkswagen Group of America Inc.
"We are the European brand that offers an alternative to mainstream American or Asian competitors," he said as keynote speaker at the opening of the convention. Jacoby says with the U.S. launch of eight vehicles in the past two years, VW now has "the broadest product lineup" in its history and can compete "in more market segments than ever before." The new product assault continues this year with the next-generation Jetta sedan late this summer, including a diesel derivative, followed by a redesigned Touareg SUV with a hybrid powerplant. Next year VW's U.S. mid-sized sedan built at its new factory in Chattanooga, Tennessee, goes on sale, followed by a new-generation Beetle that will be a "halo product," said Jacoby. "Combined, these new models will make a true statement regarding our desire to become a volume player in the United States while keeping the products that first drew consumers to our brand," he said. Jacoby said VW has to become a brand that is a "protective harbor for customers" who "want to know they will get a good dependable car for their hard-earned money." VW also is attempting to increase its brand awareness in the United States and is addressing that with an advertising campaign that debuted during the Super Bowl. The campaign, called "punch dub," features musician Stevie Wonder. On the dealer side, Jacoby said dealers have invested $800 million in exclusive stores in the past five years. Those dealerships account for 75 percent of VW's sales. Jacoby also stressed that in today's environment, customers "want action, not excuses." That means dealers need to ask, "How can I fix this problem?" rather than, "Who will pay for fixing this problem?" "We have empowered our dealers to solve problems on the spot, without sending customers to an endless series of recorded messages at some far-off call center," he said. The brand is trying to increase dealer trust and is communicating more with its national dealer council. "More than 10 percent of our dealers are actively engaged in these wide-ranging discussions about our business," he said. Jacoby and his executive teams hold annual town-hall-style meetings with dealers in each of its regions. 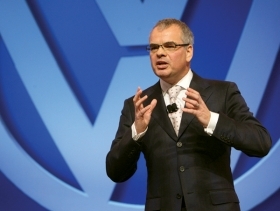 Despite the recession, he said, more than 80 percent of VW's 580 U.S. dealers are profitable.